Amazing would be an understatement in describing the historical objects that are of cultural heritage value in the George Town UNESCO World Heritage Site. George Town World Heritage Incorporated understands that objects play a vital role in constituting a city’s history and we are proud to list this component under our portfolio. George Town World Heritage Incorporated conducts and facilitates conservation efforts for objects that have stood the test of time and hold cultural significance to the local communities. George Town World Heritage Incorporated’s Paper Conservation Studio was established in 2010, with the primary purpose of restoring and conserving old or damaged documents, such as historic building plans and maps, returning them to its original form. More than 2,500 documents have since been restored by our paper conservation experts. Our team has been conserving and digitising old building plans of George Town and conducting paper conservation workshops to other state government agencies as part of our capacity building efforts. Conservation works are also being conducted on a regular basis at the Penang Botanic Gardens where our conservators restore and preserve herbarium sheets, labels, garden plans and documents. We also aim to work with clan houses and places of worship to conserve their historical documents and provide them with proper methods of conservation, handling and storage of the documents. 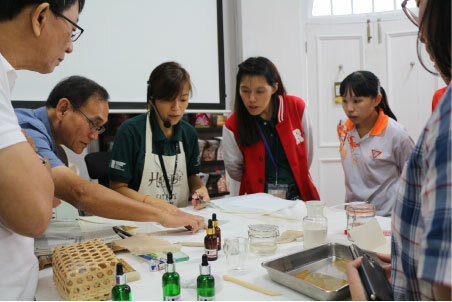 For details, call Annie Lee, Conservation Studio Coordinator at 04-261 0985 or e-mail annielee@gtwhi.com.my. An antique cloth banner crafted in 1900 is being conserved through the Textile Conservation Capacity Training for the Local Community programme launched on 22 January 2019. The cloth banner bears the images of the Eight Immortals and the words of Nine Emperor Gods in Chinese characters embroidered in gold threads, and the restoration takes place at the Hong Kong Street Tow Boh Keong Temple. A collaborative project by George Town World Heritage Incorporated, Hong Kong Street Tow Boh Keong Temple and ArtLab Australia, an organisation established by the Government of South Australia, the capacity training is an initiative that is the first of its kind in the country. 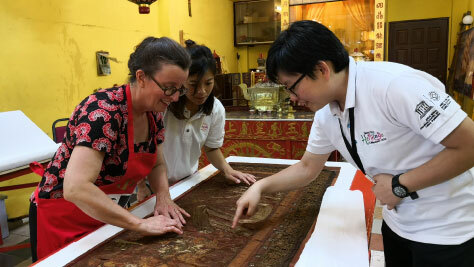 The programme is conducted by Ms Kristin Phillips, Principal Textiles Conservator of Artlab Australia, who will train a group of new conservators with knowledge, skills and techniques on the conservation, preservation and handling of textile artefacts. Capacity building workshops are also held for the local community to develop their knowledge in textile conservation. George Town World Heritage Incorporated is supervising the conservation of two historical cannons and nine cannonballs that were discovered at Fort Cornwallis, a popular historical landmark in George Town. The conservation is being conducted by the Centre for Global Archaeological Research of Universiti Sains Malaysia. Believed to be over 200 years old and measuring 2.2m and 2.35m, the cannons bear the markings of “GR” (George Rex), the symbol of King George III. They were discovered on 19 February 2018 buried 1.2m in the ground on the western side of the fort. From 26 – 28 February 2018, the cannonballs were dug up from the same trench where the cannons were found. One of the cannonballs measures approximately 10cm in diameter, while the others, resembling canister shots, measure between 3cm and 6cm in diameter. On 27 January 2019, a cannon and mortar were uncovered as well, also believed to be over 200 years old. 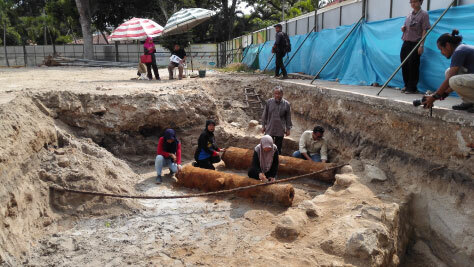 The cannon and mortar are sent to Universiti Sains Malaysia for further restoration and analysis.